just got back from the beautiful Charleston so I am tight on time to do a new Shadow episode (hope you all will forgive me), but I wanted to post a little something anyway since it's Sunday. This week the Shadow faces with a dangerous counterfeit money ring. After the innocent Michael Sullivan is sentenced to jail time becuase in possession of counterfeit bills, Lamont and Margo decide to investigate and find out why Sullivan is so afraid to tell who gave him the money. To bring down this criminal racket, they will ask help to Sullivan's daugther, Mary. Not the best quality audio in this episode, titled "Legue of Terror", but still a very enjoyable one. ... to General Rafael Mancado's exclusive party. To make sure to not miss it, head to the store this coming Wednesday and pick up issue 15 of Zorro, the first of the third arc I am drawing. Here's pages 4 and 5 to get a glimpse of the party: layouts and inks below, and final pages with colors above. Click on them for bigger versions. 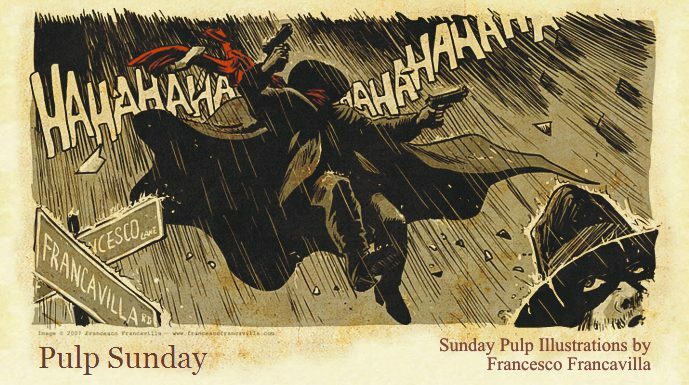 Have a Pulp Sunday everyone! In this week's episode, titled "The Ruby of Karaval", we deal with a ruby that carries a 500 year old curse. The ruby was stolen centuries ago from the gates of Karaval and ends up in modern times (well, the '30s) in the mansion of Hugo Savar, actor and collector. A notorious crook (Moonlight Joe, gotta love those names) forces a make-up artist to change Joe's face into Hugo's and sneaks in Hugo's house to steal the ruby. But things get complicated when Lamont and Margo show up in the same house and people start to die. Is it the curse of the ruby or something else? The story is Zorro #16, and the image is the back cover of issue #15 (those of you who have been following the tile know that I like to put a "coming next" teaser illo on the back of the books). Below one of the main guys showing up in issue 16. Below some of the steps of the making of this page. Issue #15 (first of my new arc) should be out later this month. As you can see, there will be still pleanty of Pulp goodness in here so stay tuned!